This page describes the legacy mk3 disting. For the current product, please see here. The Disting is a many-in-1 multifunction module, offering a variety of CV and audio processes, including a selection of oscillators (LFOs/VCOs). All algorithms have two high-precision inputs and outputs, and a third control input, exposed on a front panel knob and a CV input. The disting mk3 was awarded an 'Excellence' award by MusicTech Magazine (June 2014 issue). The disting mk3 was also nominated in MusicTech's Gear Of The Year 2016 poll. The disting mk3 was awarded 'Value' and 'Platinum' awards by Future Music Magazine (July 2014 issue). 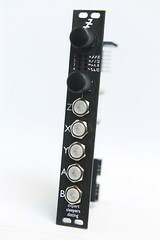 The disting was selected by learningmodular.com to be part of their core training rack. The video below was the winning entry in a video competition we held to promote the disting. It's a fun and very musical romp through the first 16 of the disting's functions. 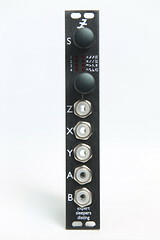 The disting mk3 is available now.